Students leaving town for spring break will come back to a very different Erb Memorial Union come early April: A number of the EMU’s public spaces will be shuttered for a renovation that is the next major step in an ongoing renovation and expansion project. “The construction, which has been primarily on the new student wing and tear-down of the ‘70s building so far, will move to the ‘50s section,” said Daniel Geiger, the EMU renovation project coordinator. The older section of the EMU includes the Fishbowl, the terrace and the south dining area. All food services in the EMU will be closed starting spring break and, depending on the location, won’t reopen until either September or spring of 2016, when the whole project is expected to be completed. For those students worried about finding a convenient spot to grab lunch during the school day, don’t worry: Food carts offering sandwiches and burgers will be stationed along 13th Avenue while dining options inside are offline. For the Fishbowl Café, as well as the downstairs Buzz Café and Union Market, the shutdown is permanent. However, when one vendor closes, several open: The Duck Store will have a new location in the EMU with convenient store-type food, UO Housing is building a grab ‘n’ go style market and Starbucks, Joe’s Burgers, Chipotle and Falling Sky Brewery will be opening their doors to students on campus. Panda Express and Subway will reopen. The Buzz Café and Union Market will have a goodbye party, free and open to everyone, on Friday, March 13, from 4 p.m. to 7 p.m. at The Buzz. 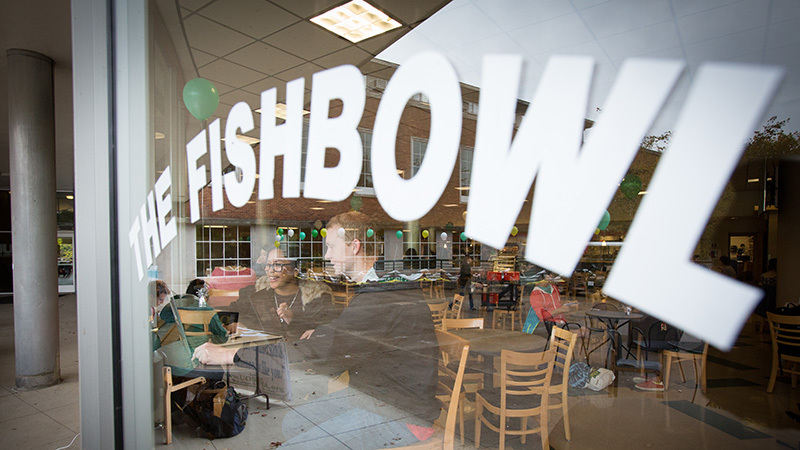 The Fishbowl itself will remain largely intact, as requested by UO students. New tiling, new furniture, a reconfigured terrace and an overall facelift are on the menu, but no major changes in the layout or the structure will take place. While several spaces are closing for the renovation, student groups housed in the EMU basement will simply move upstairs to the Taylor Lounge. For organizations like the Multicultural Center, the Black Student Union and The Pit Crew, this is the second time their offices are moving to avoid construction. The Craft Center, the Mills International Center, the Oregon Daily Emerald offices, the EMU ballroom, meeting rooms and the student radio station will remain untouched and open to students throughout the coming renovation phase. This phase of construction marks the most restricted student access to the EMU since the project began in August of 2014. The EMU renovation and expansion project has been under way for over a year and will be completed in mid-2016. To watch virtual tours of what the new EMU will look like, as well as a live-stream construction video, click here.